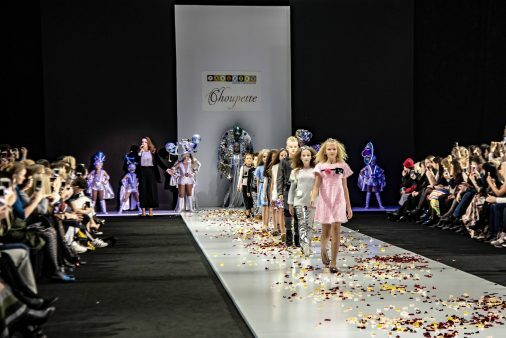 The brand Choupette has participated in the main Russian fashionable event "Moscow Fashion Week". The brand has presented the fashion-collections and a line of special occasion children's clothes. The main event of fashion season "Moscow Fashion Week" puts together the famous representatives of the Russian fashion industry. The Choupette's fashion show has taken place on October 25th . The first part of the Choupette's fashion show was a space performance with opera singing of Svetlana Feodulova who is marked out in "Guinness Book of Records" as the owner of the most high pitched voice and highest coloratura soprano. A fantastic dance in fog has made an impression on the audience and prepared them for the Choupette's fashion show. The second part of the Choupette's fashion show has passed under a singing of the jazz singer Aleksandra Sherling. The third part of the fashion show presented a line of special occasion children's clothes. A singing of the ex-lead of the group "VIA GRA" Meseda Bagaudinova has accompanied a pass of young models on a runway.